The subject matter is the game played on ice that Canadians adore. No, the other one. And since it is being played in the now-current Winter Olympics - and since people seem to either love the sport or find it (as my good buddy, Robbie Costello, put it) as entertaining as watching hernia surgery - I figure there may never be a better time to put this piece in your eye again. Last night, MY WIFE and I went to the 2006 World Mens Curling Championship at the Tsongas Arena in Lowell, Massachusetts. I'll give you a chance to let that sink in and then give you the opportunity to crack a few jokes about watching paint dry. Go ahead. I'll wait. Ready to go on now? Good. We really like this sport. Really. Yes, it's a bit like shuffleboard on ice (actually, I'd say billiards on ice is a more apt comparison) but there is athletic skill involved, as well as deep strategy. You need a keen eye, flexibility, strong nerves, coordination and, above all, you can't be susceptible to chilblains. Thank you. I'll be here through Sunday, eh? It's almost impossible not to make curling jokes. Even someone who really - really! - likes the sport, and admires the athletes involved, can see the absurdity of sliding big hunks of granite down a sheet of ice while two guys run along in front of the rock feverishly pushing brooms. There actually is a point to that sweeping, you know. If you sweep hard enough, it accomplishes two things. First, the stone will travel farther. Second, it will continue toward the target in a straighter line than if you didn't sweep. And it keeps the ice tidy. We arrived at the venue a couple of hours before the start of the matches. We wanted to grab something to eat and then take a look around. This was the first time either of us had ever seen a live curling match, so we wanted a chance to soak in whatever atmosphere might have been available. Just outside of the arena there was a hospitality tent set up. It was called "The Rock Garden" and there were a number of food vendors, as well as folks selling curling-related merchandise. Aside from the usual souvenir-type items (coffee mugs, hats, pins, etc.) there was one vendor selling curling jewelry. Yup. Curling jewelry. The stuff was actually quite pretty. Stick pins, earrings, necklaces and all the rest, in the shape of brooms. There was an 18ct. gold and diamond brooch in the shape of a curling stone. Goes for about $4,000. You think I'm kidding? Check it out. 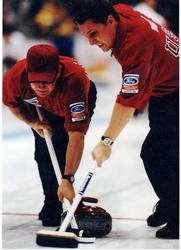 You could also buy all sorts of curling apparel, from casual wear for the fan - turtlenecks, polo shirts and t-shirts, emblazoned in your country's colors - to things meant to be worn in competition, such as special sliding shoes and rubber pads to put on your shoes so that they won't slide. About the only thing you couldn't buy was an actual competition stone, but that's probably only because the damned things weigh 42 pounds, so how in hell would you carry it around with you all night and then get it home to Finland after the matches? Yes, the stones weigh 42 pounds. Not so much like shuffleboard-on-ice now, is it, tough guy? More like tenpin-bowling-on-ice. So there! I'm being way too snotty for someone who really (really) likes this sport. It's not at all fair to the people involved. And from what I saw last night, this sport is followed by some of the nicest people on the planet. Everybody roots hard for their team, but everybody also gives a fair round of applause to the opposition and nobody taunts anyone except in a polite way. For example, during last night's USA vs. Canada match, there was one woman holding up a pro-USA sign. You know what it said? "U.S. - Eh?" It got a big laugh from both the Canadian and American fans. There is also no "in your face" crap from the athletes themselves. As a matter of fact, they are the least demonstrative bunch of competitors I've ever seen. And the fans never boo anybody. Well, almost never. Last night, during a particularly tense point in the Sweden - Denmark match, one of the Swedish players slammed his broom on the concrete behind the rink, upset at his team having basically lost any shot at making the medals round. The sharp sound made by the handle of the broom striking the hard surface was followed by the sound of a gasp - a sharp intake of breath by many in the crowd - and then there was one lone "Booooooo!" from somewhere behind us. As many people turned to look at the fellow who was booing as were now looking at the Swedish kid who had slammed down his broom. If you have any interest at all in the sport, I'd highly recommend getting out to see a match. As sports go, it's one of the easiest to watch. No matter where you're sitting in the arena, you can clearly see everything that's going on. The folks who follow it closely are very nice and will not belittle you in any way if you ask them a stupid question. They're more than willing to teach you about their passion, and will do so with a smile. All in all, it's a very agreeable night out. And I guess that's it. I could rack my brain for something clever and snarky to end with, but I won't. It was fun and we enjoyed it. Bravo to the curlers. Welcome back to 2018. Maybe the game will have a huge breakthrough in the United States this year. Probably not, but this is the time of year when everyone around these parts talks about it and if the American teams do well, who knows? Americans like winners. Only the truly weird want to be identified with a sport most people consider odd and which we as a nation don't play very well. Given the relative lack of curlers in this country, I now find myself able to entertain notions of taking up the sport and maybe making the Olympic team in 2022. 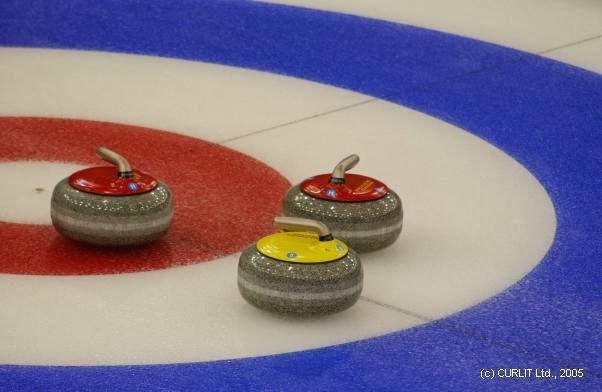 It is the only sport I can even imagine myself playing at some sort of decent level by the time I'm 64, so for that farfetched dream alone, curling is now my favorite sport at the Winter Olympics. I suspect the average curling match involves a lot of beer. Well it appeared in a Beatles movie, so it's got that going for it, which is nice. . .
You made the sport sound interesting. I've been watching the Olympic mixed doubles curling on the telly, and it's truly FASCINATING! OK, so I'm Canadian, which explains a lot. But the skill involved in sliding those rocks exactly where you want them on a sheet of slippery ice, well, quite amazing. I've tried it, and it's really difficult. The first time I tried it I threw the rock so hard I thought it might go through the opposite wall and out into the parking lot. Go CANADA Go!! Truly makes me want to try it. Sounds like fun. Of course, the stone weighs almost as much as I do. It hasn’t been spoiled yet by commercialism. I've heard a lot about curling this Olympic season. I think it's the new hot thing!